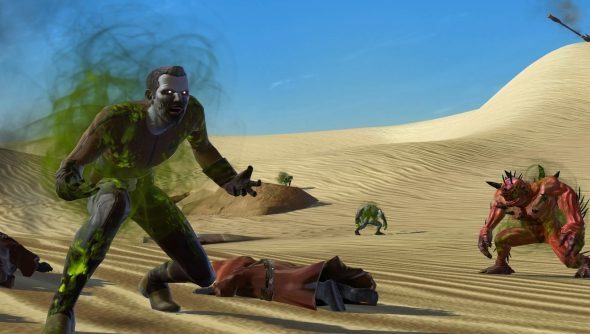 SWTOR is struggling harder than a bounty hunter in a Sarlacc’s gut. And it’s going to take more than an exploding jetpack and a concussion grenade to blast it back out. We think there are ten things that Bioware need to do to stop a slow slide into the backwaters of Alganon. Some of them are easy fixes. Others are going to take serious work. This has to happen sooner rather than later. Already, playing on the empty servers is just painful. Thankfully, Bioware promised they’re coming but every day they don’t arrive, more people stop playing. The team-based sections definitely need an effective looking-for-group system. Unlike WoW’s it would be really good if the LFG system had social ranking to deselect for people who don’t play well in groups, but who just AFK and loot-grab. It would also be great to get cross-realm LFG, given the lack of players at the top end. As much we love the Warzones, we hate Huttball. We want to avoid Huttball more than anything else. Let us opt in and out. Sure, it’s going to kill Huttball. But you shouldn’t make people play things they hate just because you spent a billion hours programming them. If no-one wants to play it, then you have to fix it. Simply put, many players doing Warzones, Flashpoints or Ops or merely groups lose sound after thirty minutes. Indeed, often the entire team will lose sound. The only way to get it back is a restart and shutdown. Given bosses often operate using sound cues (which, incidentally, is appalling considering how many deaf players there are out there), certain quests become extremely difficult to complete. How can a killer sound bug live on for so long in a game that was so proud of being all-speech focused? This bug doesn’t seem to make it on to the known issues list but recurs for many players. It’s difficult enough playing with friends on empty servers, but the level gap makes it just ridiculous. Why haven’t more games instituted a sidekicking or mentoring system like City of Heroes? Or rewarded players who do tuition, like Eve does? Tab-targetting doesn’t work. Target nearest doesn’t always work either. Especially not in Warzones. Just fix it. Give us a reward structure for finishing flashpoints with lower player numbers, especially epic flashpoints. That’s it. We’d like more stuff for the majority of players with capped characters. Give us some daily quests and more top-level gear. Oh, and make Ilum more exciting – though we appreciate you fixed it after the exploiters, it’s still not quite ‘Galactic War’. Something to do in all those empty shops and cantinas would be amazing. Look at what Otherland is doing with its myriad pub games. Copy it before the game comes out! Other games let us do it; Rift made a virtue of it, as did long-dead Tabula Rasa. Let us create alternate specced. We’ll still play the game to buggery and back, we just won’t get bored grinding up identical alts.